The name Yilan derives from the aboriginal Kavalan Tribe, before 2009 the county's official name was transliterated as Ilan. Yilan is located in northern Taiwan, adjacent to New Taipei City, Taoyuan City, Hsinchu County, Taichung and Hualien, in the east facing Pacific Ocean. Yilan country is divided into 1 city (Yilan City), 3 Urban Townships (Luodong, Su'ao and Toucheng) and 8 Rural Townships (Datong, Dongshan, Jiaoxi, Nan'ao, Sanxing, Wujie, Yuanshan and Zhuangwei). Total area is about 2,143sq.km., ranked 6th of 22 counties in Taiwan. Has a population of about 458,777 people in Dec 2014, ranked 17th of 22 counties in Taiwan. 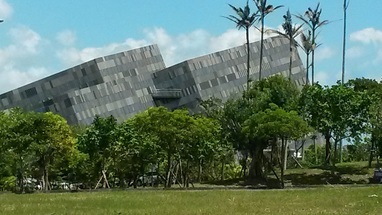 The museum is all about Yilan, from geography, history and culture of Yilan, the original inhabitants to modern day. The exhibits are arranged by floor as the Ocean Level, Plains Level and Mountain Level. Overall the exhibits are well thought out and well laid out. A beautiful beach right behind the Service Area (Yellow Building), is a place for surer, swimmer, relaxing. There is paragliding activities too. Directly across the sea you see the turtle island in the far end, the Turtle Island is the place for Whale and Dolphin Watching. A very nice beach/ place for people who wanted to take a break after heavy travelling or hide away from the city-life for a little while. 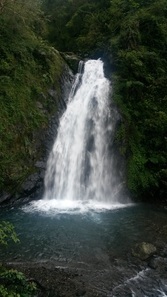 This waterfall is the upstream of Dongshan river of Yilan. From the entrance you take a 15 minutes' walk on the soft trail surrounded by woods, be able to feel the cool air while walking on the soft trail, till you reach the wooden stairs you reach the viewing deck to this 30 meters height waterfall rumbles from the cliff face. Many said that the fall looks like the bridal veil, but it will be good you come visit this fall to feel it yourself. 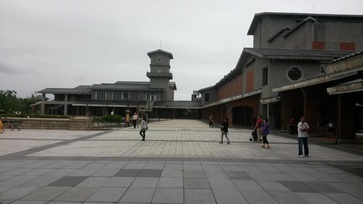 By the side of Dongshan river is where the National Center for Traditional Arts located, the goal of this center is to preserved Taiwan traditional arts and culture, all buildings and streets display the olden day of Taiwan. You can stroll casually among artistic creations. listen to music, enjoy the Chinese opera or sometime you may also watch the olden days Chinese parade, anyway the center organized difference program at the difference seasons. The name Plum Blossom do not mean that there is plum blossom around the lake, if you are lucky you may find some plum blossom, the name actually means the shape of the lake looks like plum flower. This is a natural lake or reservoir, round the lake there is a 2.2km trail for visitor to scroll round or you may rent a special "bicycle/tricycle" (this special bicycle can take up to 4 persons) too. 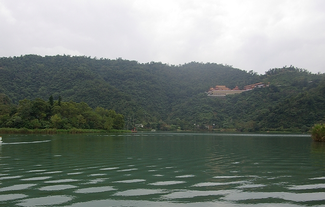 If you are the temple lover, you may also visit to the "San Qing" temple, is up the mountain across the lake, we are able to see this temple when you arrival at the lake, the temple looks grand. It is nice to be here in the morning to view the sunrise and during sunset looking at fishing boats sailing back on the golden wave is another wonderful scene. This free hot spring park for foot spa is within the town city of JiaoXi. Many local and visitors are here sited around the pool to enjoyed their free foot spa. In the park area there are massage and public hot spring spa with very low cost, for people who like to have more privacy may opt to go to the nearby hotel or private spa setup too, of course the privately runs setup cost much higher than the public one. Something interesting in this center, all products and goodies are made with chili, such as; ice cream, biscuits and other tip bits. This center is next to the free foot spa area by the road side in Tangweigou, you can never miss if you pay attention to the signboard "Chile Ice Cream" or "Chile Dessert". Yilan is place full of hot spring so do the whole of Taiwan. A visit to QingShui Geothermal can never be a waste of time, it is an interesting place for many visitors, you can cook your food such as eggs, corns, sweet potatoes and vegetable with heated springs at water temperature of 95 degrees centigrade and at the same time you may soak your legs into another pool with the temperature of about 40 to 42 degrees centigrade to enjoyed the foot spa before or after you enjoyed your hot spring egg, corns, sweet potatoes or vegetable. There are many of fruit farm in Yilan to go around during difference seasons to have fruits picking, it is wonderful to go round the fruits farm and picking the fruits yourself. The one I recommend in Yilan is PuJin Fruit Farm. The famous night market in Yilan is known as Luodong Night market, like many other night market in Taiwan, you can find foods, drinks and local delights here too, many visitor take the opporunity to take their dinner here.